First of All Best Wishes to all of the Candidates who successfully got registered under NIOS D.EL.ED Two year education teaching programme. Under NIOS DELED Course Lakhs of Candidates have been registered and looking further for a enhanced career through this two year programme. Now after Admission process and issue of IDENTITY CARD, Lots of learners are facing issues like availability of study material, assignments, and other course specific information. I would like to Inform all learners do not get confused NIOS D.EL.ED course is distance course which itself is being monitored by State Level Authorities and Central government. The whole project is Digitally Monitored and all Information related to course is provided on Official Portal of NIOS DELED. Examination Centres will be identified by the states and these centres should be State and Central Government Senior Secondary Schools/DIETs/College of Education. The process of examination and conduct of examination would be the responsibility of the States. NIOS Chairman has already supplied All Information regarding setup of STUDY CENTERS which are going to be made in each district with the help of State Education Board Authorities, where Learners will contact for Face-to-Face interactions with teachers available there for NIOS DELED course. Remember In distance Courses Like provided by IGNOU ,NIOS ,SMU there are study centers in each city where students submits their assignments, take helps of teachers as per classes arranged and get all information related to particular courses. For giving Semesters Exams Government colleges of the same city are assigned for conducting exams. So that students can easily go for theory and practical exams in their own city. In the same way NIOS is preparing institutes , schools and colleges for DELED Course Interaction. For complete reference you can watch NIOS Chairman message. Now Let us do a minor surgery of NIOS DELED ASSIGNMENTS to know more about it. NIOS DELED LATEST UPDATE FOR STUDY CENTRE AND ASSIGNMENT SUBMIT DATE NEW! WHICH COURSE ASSISGNMENTS YOU NEED TO PREPARE FOR FIRST YEAR? HOW TO DOWNLOAD NIOS DELED ASSIGNMENTS PDF? Nios DELED assignments pdf are available on NIOS website also you can download assignments from the links give below. You can find assignments in NIOS Study Material section given at the end of each block course. CLICK HERE TO DOWNLOAD ASSIGNMENT FRONT PAGE New! CLICK HERE TO DOWNLOAD ASSIGNMENT WRITING INSTRUCTION PDF New! DOWNLOAD NIOS DELED SOLVED ASSIGNMENT ANSWERS (501 502 ) IN BENGALI New! Till now only following Assignments are available on NIOS PORTAL, you should start studying and preparing answers for these assignments questions as per NIOS DELED Books provided. Rest of the assignments will be uploaded soon. Learners can prepare assignments in their own respective state language. HOW TO PREPARE NIOS DELED ASSIGNMENTS? the question and its various aspects. limit as far as possible. At the same time, make the descriptions adequate and not too short. The word limit is set to sharpen the focus of the responses and not to restrict your expression. not properly readable, you may then send typed answers. 4. You have to send/submit the assignments to the study centre you are attached. (To be notified All Leaners soon). WHAT IS THE FORMAT OF ASSIGNMENT? HOW TO WRITE THEM? poor grades. Don’t send short/incomplete poorly written answers. Use only A4 size paper for your answers. Make sure you answer the questions on the basis of the Study Material Provided by NIOS. have to resubmit it in a situation when it may have been lost in postal transit. first page of your response(s). holiday the assignment response should be submitted on the following working day. for submitting the Assignment to the study centre. 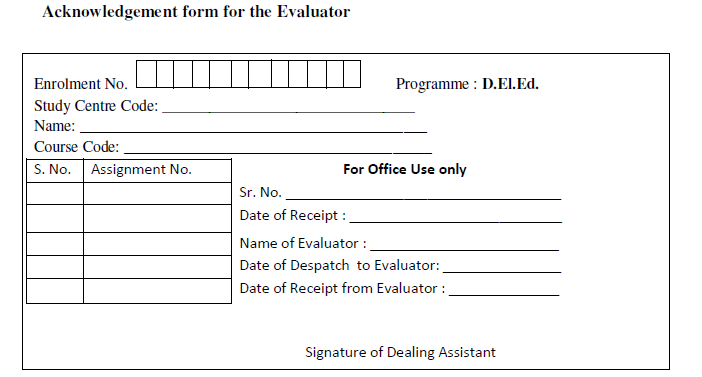 This form is used for all the assignments of the D.El.Ed. Programme and get photocopy of this Proforma separately for all the assignments. Notes: 1. 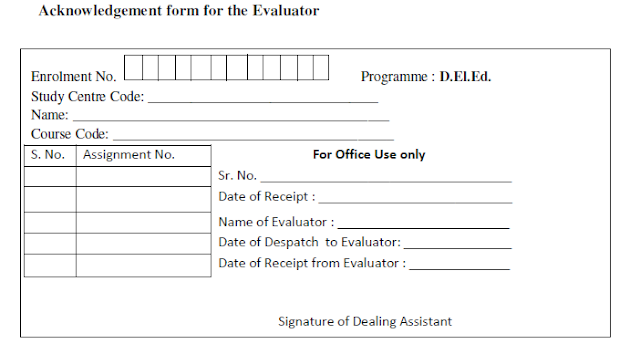 Submit this form to the coordinator of your study centre along with the assignment. 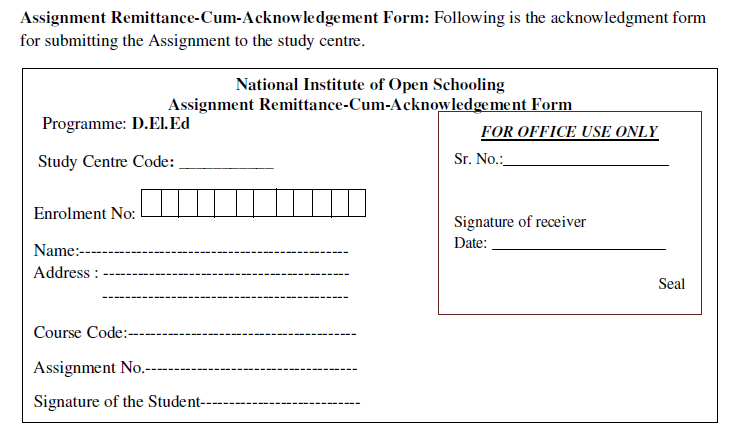 WHERE TO SUBMIT NIOS DELED ASSIGNMENTS? 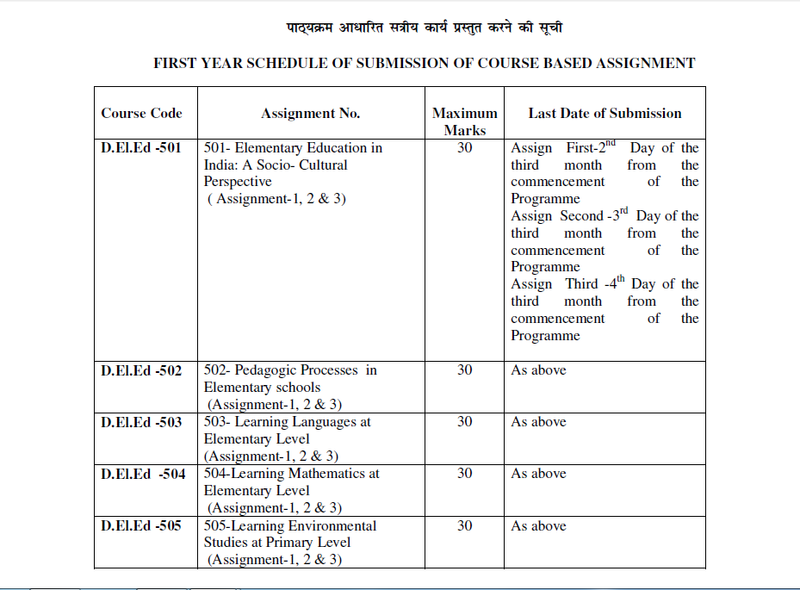 These assignments are to be submitted to the study centre within the date prescribed in the schedule. Always retain a copy of the assignment responses with you. Details of the study center allotment will be provided to each learner very soon. Whole NIOS Team and Co-ordinators are working for establishing study centers in each state and districts to provide Face-to-Face Counselling sessions and other activities related to course. Till then sit back and relax, Start your studies through books provided on NIOS Portal, Watch Lectures on SWAYAM website or Download NIOS DELED App from google playstore. READ MORE: HOW TO REGISTER ON NIOS SWAYAM PLATFORM FOR DELED COURSE? WHAT IS THE LAST DATE FOR ASSIGNMENT SUBMISSION? Any updated information regarding assignment submission will be notified by NIOS PORTAL soon. WHEN WILL BE THE EXAMS FOR NIOS DELED? HOW TO SUBMIT EXAM FEE? All the information regarding exams will be uploaded on NIOS D.EL.ED portal.As admission process has been recently just over so it will take time to all setup like examination centers and study centers. As far as exam fee is concerned it would be payed online between 1st feb 2018 to 15th feb 2018 for First semester. Each and every detail is going to be furnished on NIOS WEBSITE later. Hall Tickets will be available on NIOS website www.nios.ac.in and also on the website of Regional Centres, NIOS. I hope this article will be helpful for all of you, Each detail provided here is extracted from official site of NIOS. Always rely on official updates being provided there on NIOS website. If you have any query or facing any issue kindly share it in comment box. WHAT IS LAST DATE FOR THE ASSIGNMENT TO BE SUBMITTED (NIOS D EL ED 1ST SEM 501 502 503) & WHERE TO SUBMIT IT (IN WEST BENGAL, DIST – BIRBHUM). study center se related details official site par update ki jayengi regular check krte rahe. telgu medium questions papers are still not available on nios website, you can append the english version question papers, and answers in telgu. There will be no issue for this. Shall we write dled exam in tamil language ? Without any doubt answer is yes, all teachers are free to choose their exam language. You can opt your exam language during fill of online exam form.